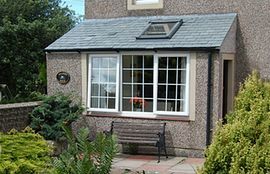 Sycamore Cottage is located in Mealsgate which is a rural area just outside the picturesque village of Bothel; just outside the Lake District and only a short distance from Bassenthwaite Lake. This charming rural cottage is surrounded by beautiful Cumbrian countryside, farm fields and is adjacent to a working farm. 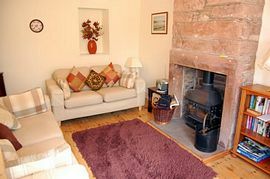 This cottage sleeps four people in two double bedrooms and has a cosy lounge with real wood burning stove, large family kitchen and dining area with conservatory and seating to the rear. 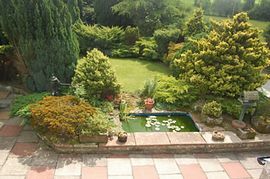 Sycamore Cottage also has a large front garden complete with outside seating, lawned area, patio area as well as a pond. This cottage is fully central heated and access via the front door enters into the kitchen and dining area; overlooking the beautiful garden and surrounding countryside. Kitchen & Dining Area: This large family kitchen and dining area is a traditional country style kitchen with dining table and seating for four. The kitchen is equipped with everything you would need including: electric hob and oven, microwave and fridge. Living Room: Complete with comfy sofa seating, TV, DVD player, CD/radio and real wood burning stove. 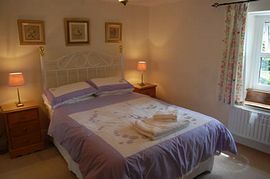 Double Bedroom 1: With double bed, wardrobe, chest of drawers and bedside tables. Double Bedroom 2: With double bed, bedside table and shelf. Family Bathroom: Complete with bath and shower over, toilet and wash hand basin. 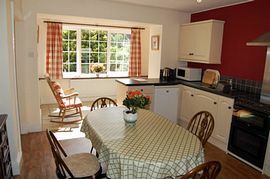 Short Breaks are avalible for more information please call. 10% Discount applies for couples booking full weeks.